Are you wondering how to keep safety glasses from fogging up? There are many ways of doing it. 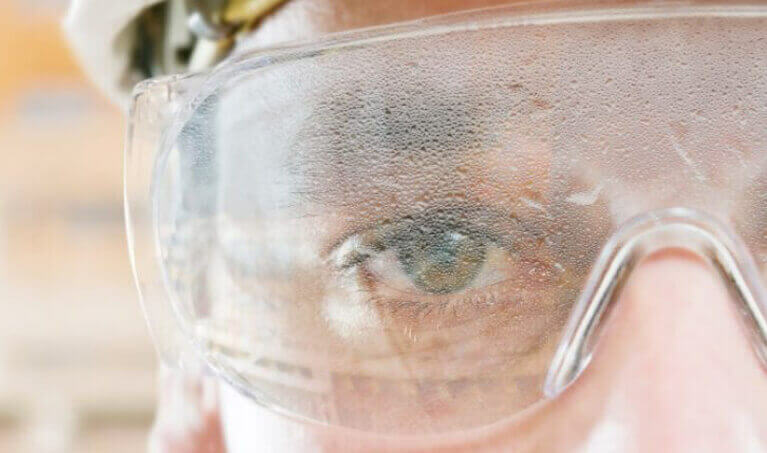 When you are working in a hot environment, the glasses are more likely to heat up which causes them to fog up. When you are wearing snug safety glasses, you prevent effective flow of air, which causes the glasses to fog up. When you are working in an environment with a lot of moisture, the lenses are more likely to fog. You are bound to sweat when you are working too hard or working in a hot environment. When you sweat you increase the moisture levels in the air contributing to fogging. If the fogging is coming about due to wearing safety glasses that are too tight, you should go with units that have a design that allows the air to easily flow around the lens. When you wear such glasses you ensure that no moisture is deposited on the glasses. There are anti-fog sprays, wipes, and gels that can help you get rid of the fogging problem. It’s easy to apply the coating as all you need is spray it and you are good to go. You can buy the anti-fog products online or from your local store. If you have tried all of the above and you aren’t solving the issue, you should consider investing in anti-fog safety glasses. These units come with lenses that are specifically designed to prevent the fogging from coming about. The glasses also feature frame styles that allow improved air flow. Other safety glasses sit away from your face which comes in handy in limiting the effects of fogging. When working, you should consider wearing a headband that will soak any sweat that might be forming on your face. This reduces condensation that can build up in your glasses. When you are working in cold environment, it’s common to wear layers to keep you warm. You should note that wearing a lot of clothes puts your glasses at the risk of fogging up. This is because you tend to sweat a lot and the sweat will reach the glasses. For you to be on the safe side, you should avoid overdressing to the extent that you are sweating. You should wear just enough clothes.